The first two limbs of the eight-fold path of yoga sutras - the basic text for classical yoga - are examined in this spiritual guide to the practice of yoga. Foundational to all yogic thought, they are considered to be the guidelines to the yoga way of living that free individuals to take ownership of their lives, direct them toward the fulfillment they seek, and gain the skills to choose attitude, thought, and action. 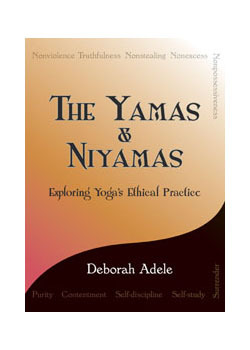 The first five guidelines are referred to as the yamas?a Sanskrit word that translates to "restraints" - and encompass nonviolence, truthfulness, not stealing, non-excess and non-possessiveness. The last five are referred to as the niyamas, or observances - purity, contentment, self-discipline, self-study, and surrender. A self-study section at the end of each chapter may also be used by instructors for group discussion.